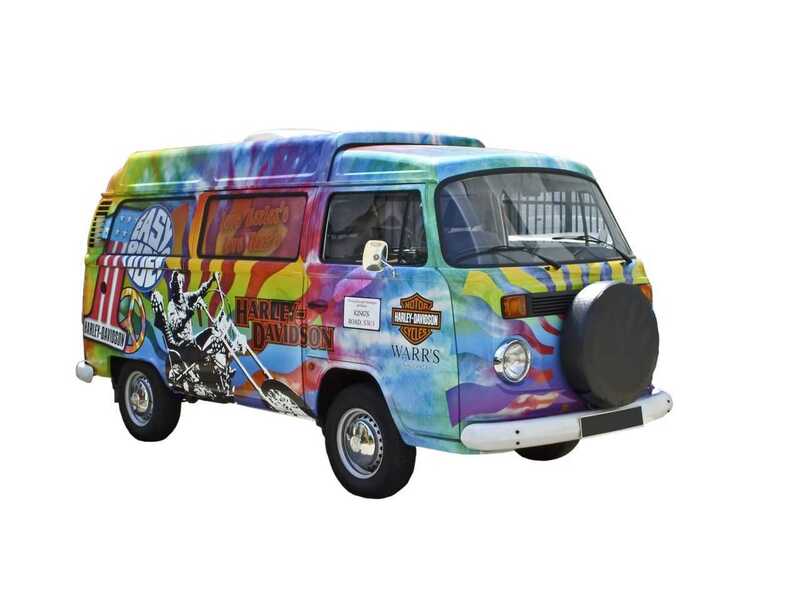 The title of this piece is an affectionate nod to the ‘road’ classic most famously — not to mention most emotively and passionately — delivered by Janis Joplin. Although “Me & Bobby McGee” is actually a tale of hitchhiking and lost love, the chorus explores the very nature of ‘freedom’, while the verses conjure up such a vibrant image of a journey “from the coalmines of Kentucky to the California sun”, that I invariably find the lyrics tripping through my head when I’m enjoying a languid cross-country journey on a motorcycle. 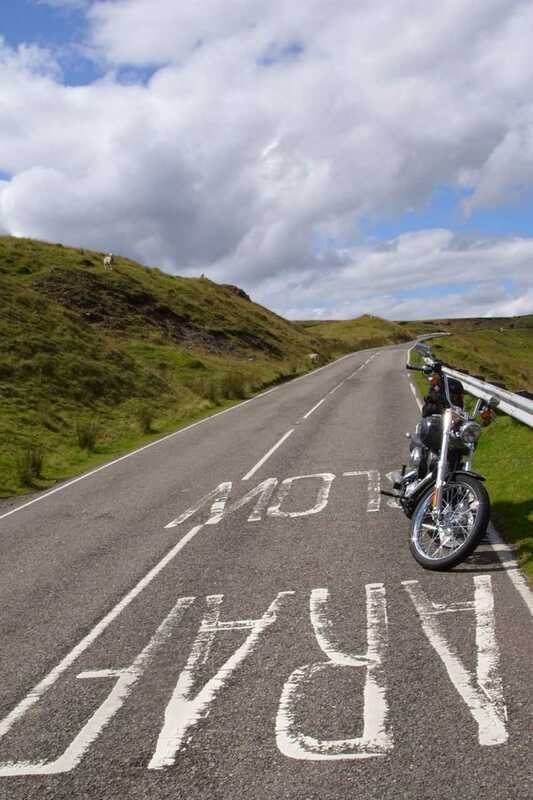 My 2007 ride to Wales was no exception. In fact I found that riding a Harley chop, with 90 cubic inches (that’s 1584cc to you Limeys) of lazy V-twin barking through a pair of ‘Screaming Eagle’ exhausts ensured that in my solitary moments my thoughts were crammed with song titles, iconic biking images and a whole host of other sundry motorcycling clichés. Riding low with the seat of my pants just over two feet off the tarmac, my feet forward, and my arms dangling from high, wide bars, it was hardly surprising that I found myself in a recurring Easy Rider fantasy — especially when you consider the kind of subliminal effect that movie had on the psyches of men of around my age. The story of a hippy road trip across the southern states of 60’s America on a pair of HD choppers defined the epoch, while “Born To Be Wild”, which opens with the ultimate biker’s credo: “Get your motor runnin’, head out on the highway, lookin’ for adventure, in whatever comes our way”, is a Pavlovian trigger (Warr’s wonderfully hippyfied VW camper bears witness to just how important the Easy Rider factor is to their sales). The idea for this particular road trip came up a few weeks earlier when I received an email from the Venezuelan Information Centre announcing a “Welsh Latino Extravaganza” entitled El Sueño Existe or Mae’r Freuddwyd yn Fyw (The Dream Lives On). 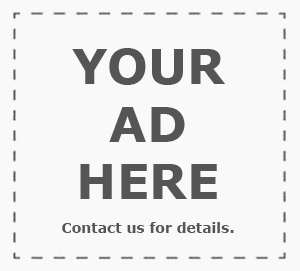 I’ve been mucho impressed by Latin American politics recently, so the idea of riding right through Mid-Wales in August to listen to Latin music in a small valley town ticked all my boxes. 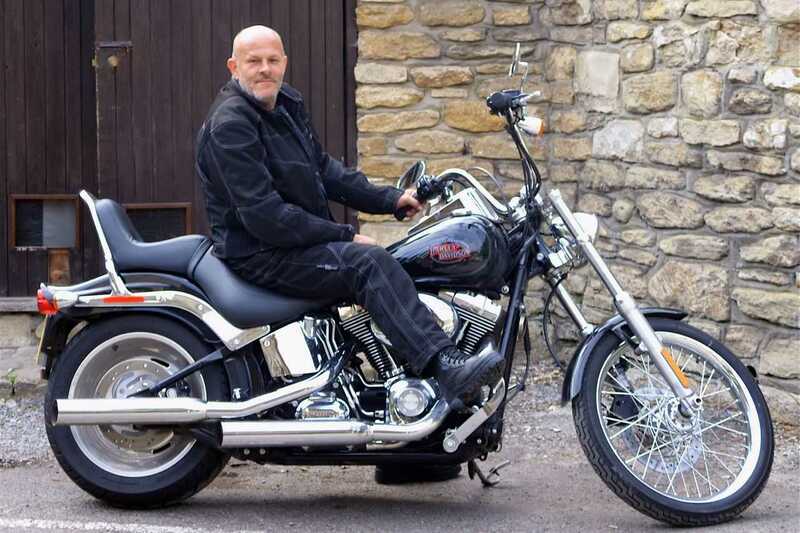 Before I messed up my right leg, my own bike was a Yamaha SRX6 – a nippy lightweight single complete with a ‘clip-on crouch’ – so as you might imagine, I didn’t have any laidback, heavy, feet-forward Harley Davidsons on my road-testing wish list. However, with rear-sets now well and truly consigned to the past, I’ve been forced to reappraise my preferences and having ridden the Hyosung Aquila, and found it comfortable, I couldn’t help wondering what a V-Rod would be like, and whether it could possibly justify the £7,000 price hike over the counterfeit Korean. 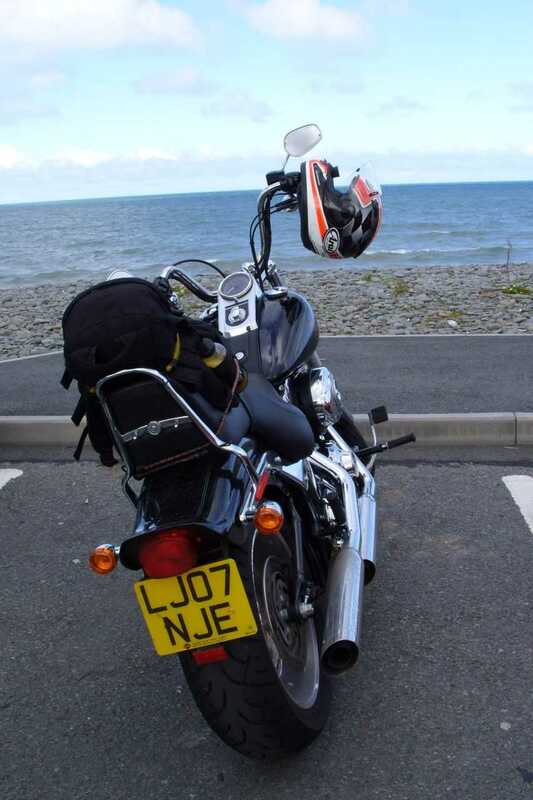 I spoke to the HD press office and lined up a Night Rod (the Johnny Cash version of the V Rod) for the trip and to be honest I was getting rather excited at the prospect of riding the most sophisticated machine in the Harley stable. Consequently I was disappointed to be told at the last minute that due to circumstances beyond their control I’d have to settle for a Softail Custom. But as I rode out of Warr’s yard and onto a gloriously sunny Kings Road, arse down, arms up, and feet forward, with the aforementioned pipes growling beneath me, I couldn’t help picturing Captain America and smiling wryly to myself. In the summer of 2000 I enjoyed an epic trip to West Wales on the ratty SRX6 I owned before my last one. 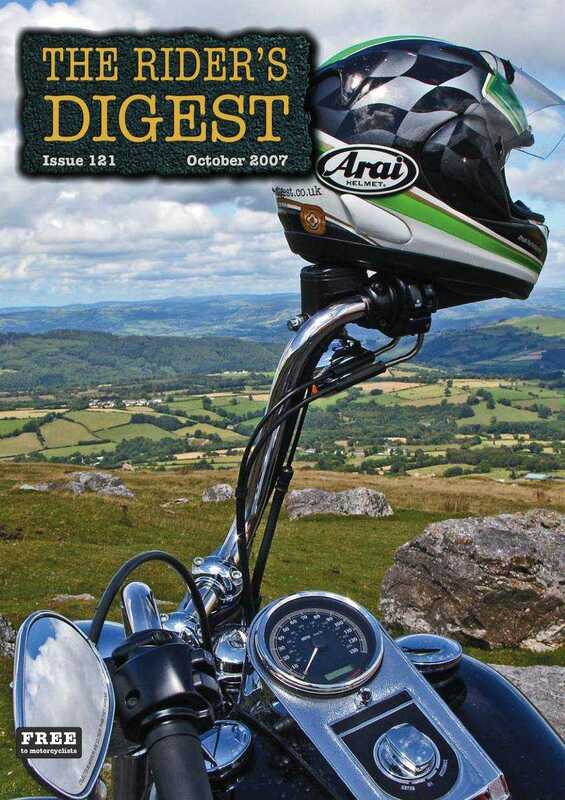 I described the journey in issue 38 in an article that concluded by saying, “Nah, when it comes to a trip on a bike: You can take the M road; I’ll take the Zen road”, which still sums up my attitude perfectly. There’s no question motorways are useful if you need to be somewhere and you are intent on covering lots of miles quickly but when I climb onto a motorcycle for a serious journey, I’m usually looking forward to the bit between A & B every bit as much as the prospect of arriving at the other end. 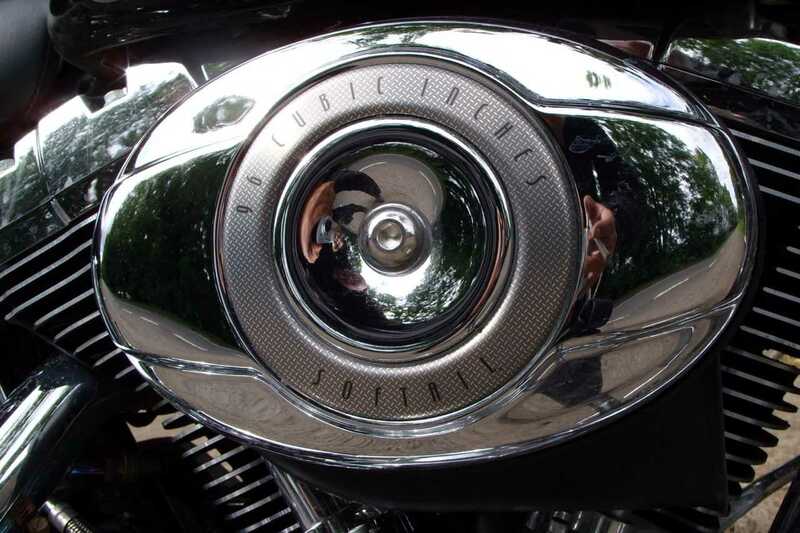 On that journey in August ’00, I limited myself to a 75mph maximum cruising speed to minimise the danger of my aging single vibrating itself to a standstill and while there seemed little likelihood of that happening to the ’07 plated Softail, those high wide bars turned me into a mainsail and imposed a very similar limitation. Fortunately once I swung off the M40 at Oxford that was no longer an issue as the same sort of speed felt like plenty away from the hustle and bustle of the motorway. Heading west, aside from the odd by-pass, the A40 has changed little in my lifetime so the ageless character of the big V twin, helped to foster a feeling that I was in a time warp. The wide open spaces and cream Cotswold stone cottages of Gloucestershire, rolled seamlessly into the hills and forests of Monmouthshire, with only the “Croeso” sign to indicate that I had crossed any line and the further west I rode the more dramatic the scenery became, until at last the mountains ahead forced the road northwest towards Abergavenny — the gateway to god’s own riding country. 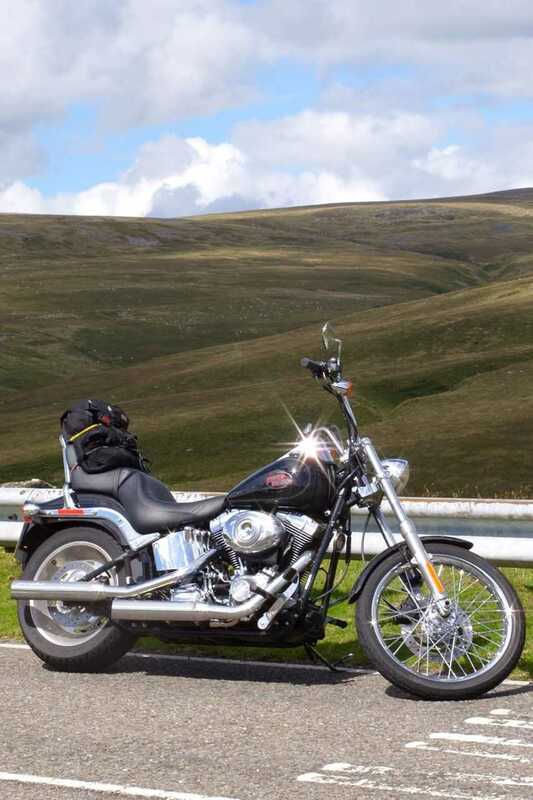 If I’d asked Google maps to plan my route, it would have sent me up the M1, to the M6 to the M54, so that by the time I reached a stretch of interesting road somewhere beyond Shrewsbury, I’d have already been too jaded with the Harley to appreciate anything good it had to offer. As it was, by the time I turned off the A40 onto the A479 just past Crickhowell it was all starting to make sense and we were beginning to cook with gas. 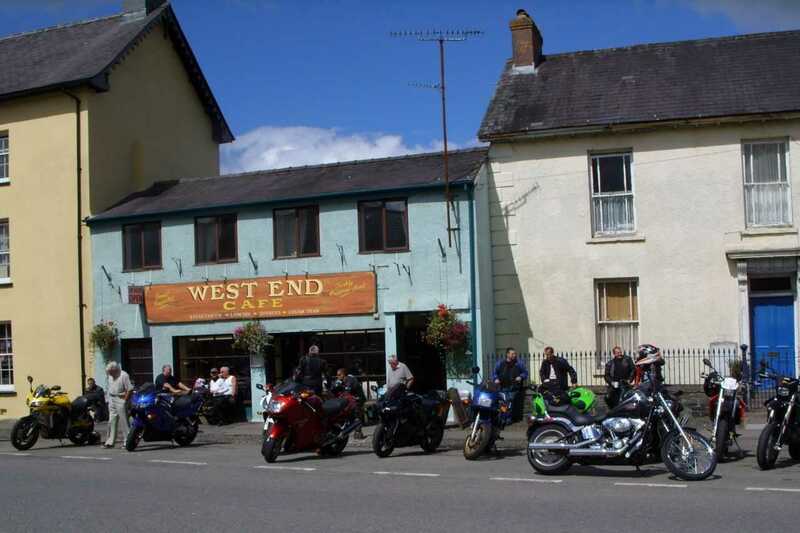 And by the time I stopped in Builth Wells to buy a drink, I was surprised to realise that the chop was actually delivering in all the areas that I consider important for a motorcycle: sensation, speed, sound, and — dare I say it — soul satisfaction. 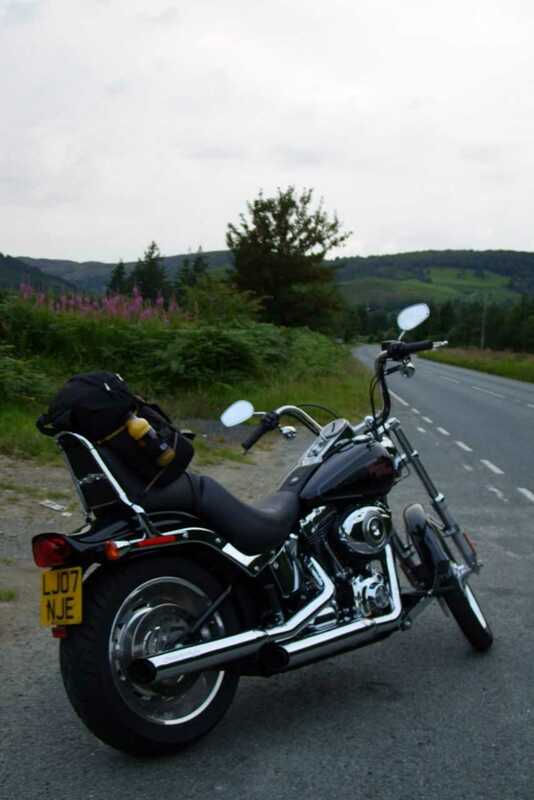 It started raining just north of Rhayader (well it would hardly have been a trip to Wales otherwise), but me and the hog were getting on fine by then, and with the end of our journey a matter of miles away, it had little effect on our mood or our velocity. I chose “Me & Harley McDee” for the title over the more obvious Steppenwolf anthem, because I thought it reflected the fact that the HD, in common with the fast food giant, is a universally recognised symbol of US cultural imperialism and as American as mom’s apple pie (and the tendency to support brutal fascist dictatorships in Central and South America) so I was a little worried how my socialist Latino compadres would react to it. 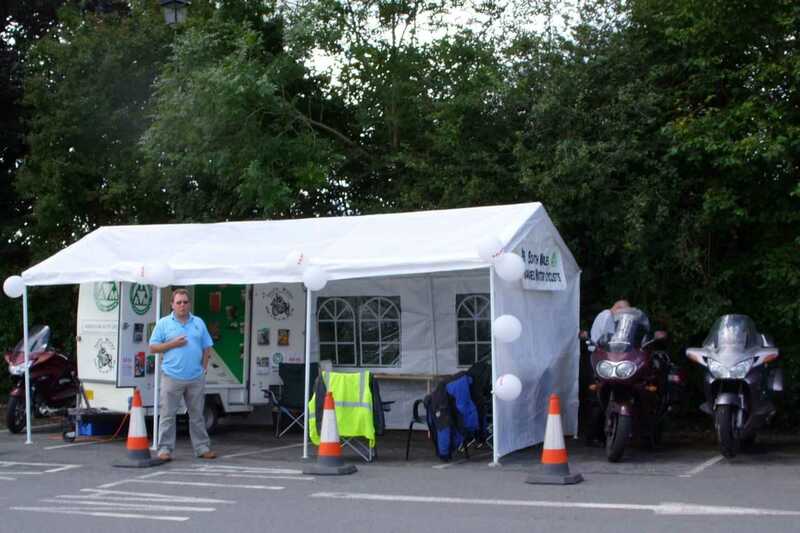 However, I’m ashamed to say that when I finally arrived at the festival site in Machynlleth, all the Brits I saw looked like such earnest, knit-your-own-yoghurt, mossy-chested vegans, that I jumped straight back on the bike and headed for Aberystwyth to find a B&B. I don’t know what the lights are like on the Night Rod, but this model is definitely a Day Hog. I haven’t experienced such a pathetically ineffectual headlight since I made the mistake of riding around the Gower Peninsula at night on a Suzuki GT250 nearly thirty years ago! The pathetic glow that dribbled from the front of the bike was absolutely pitiful and had me down to less than 40mph, while I desperately prayed that rear light was bright enough to keep the locals off my arse. Aside from the pitch blackness and the fact that the rain had become heavier and more persistent, I had also covered 160 miles since I last topped up, and Martin at Warr’s had told me to ignore the gauge in the dummy left-hand filler on the petrol tank and look out for fuel when the trip meter hit 120! 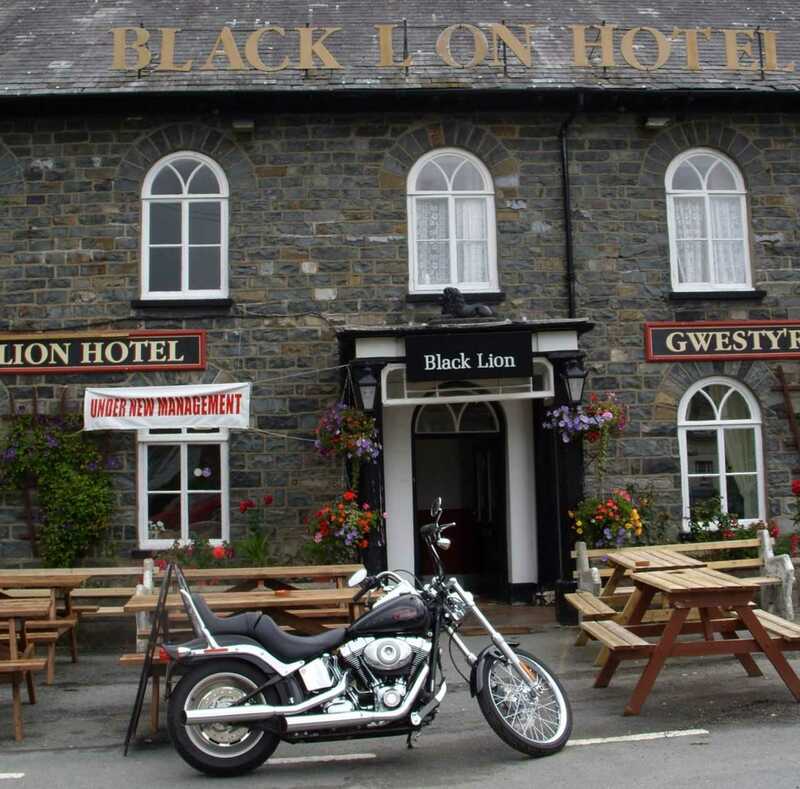 Riding slowly through the village of Talybont I spotted the Black Lion Hotel, and stumbled into the bar dripping to ask landlord Mark if he had a room. He did, and although the kitchen had shut, his wife Vicky agreed to cook me a meal if I chose something simple. 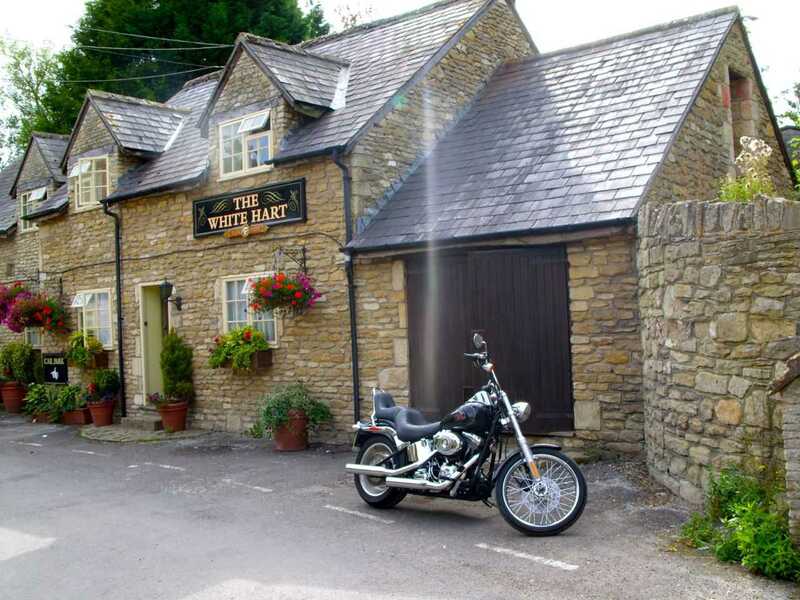 The nosh, the choice of real ales, the bed, and the breakfast, were all first rate; and although we were probably in one of the better postcodes for vehicle theft, Mark opened the wooden gates alongside the pub and insisted that I lock the bike away for the night. 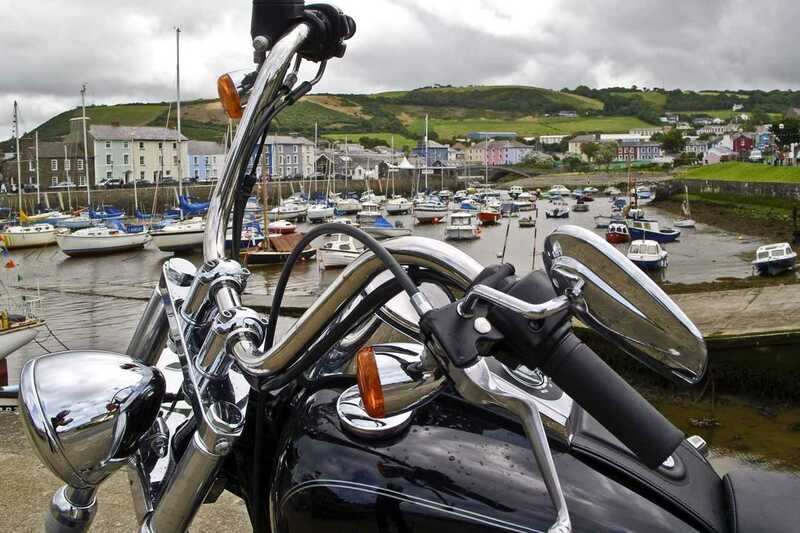 When I left the next day, I rode two minutes down the road and sat on the sea wall admiring the bay, with its classic sweep from the docks and recently gentrified “Maritime Quarter” to the east, all the way to Mumbles pier in the west. In many ways little had changed in Swansea since I spent Christmases and long summers at my grandfather’s house in the sixties and the route I was planning to take — the A48 to the old Severn bridge, followed by the A4 — would be pretty much the same road my family travelled for all the years between the opening of the bridge in 1966 and the completion of the M4, god-knows how many years later. I rumbled patiently through the dawdling traffic until I hit the dual carriageway just past the docks, when it all thinned out so I wound it on a bit. I filled up with unleaded at 92.9p a litre [those were the days! – Ed] in the Shell garage by Jersey Marine (and worked out that I’d been averaging a very reasonable 47mpg) before joining the M4 briefly to get beyond the industrial sprawl of Port Talbot and the Margam steel works. 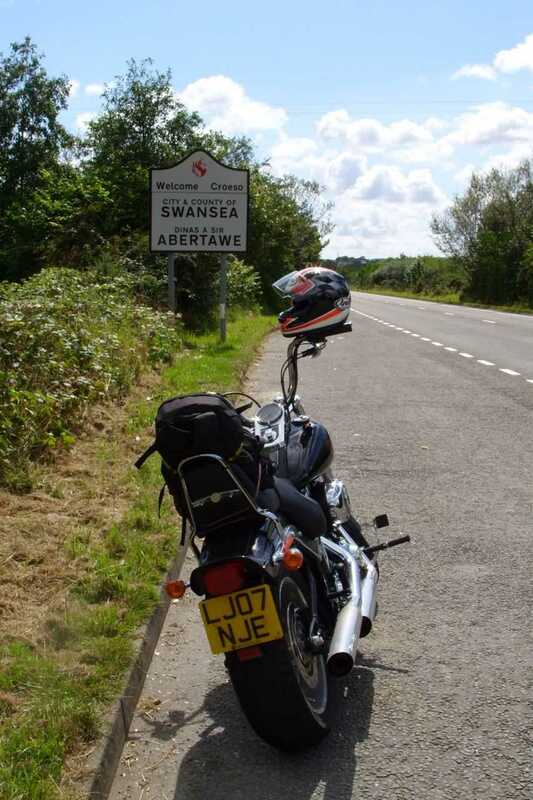 I swung off again at Junction 38 where I picked up the A48. 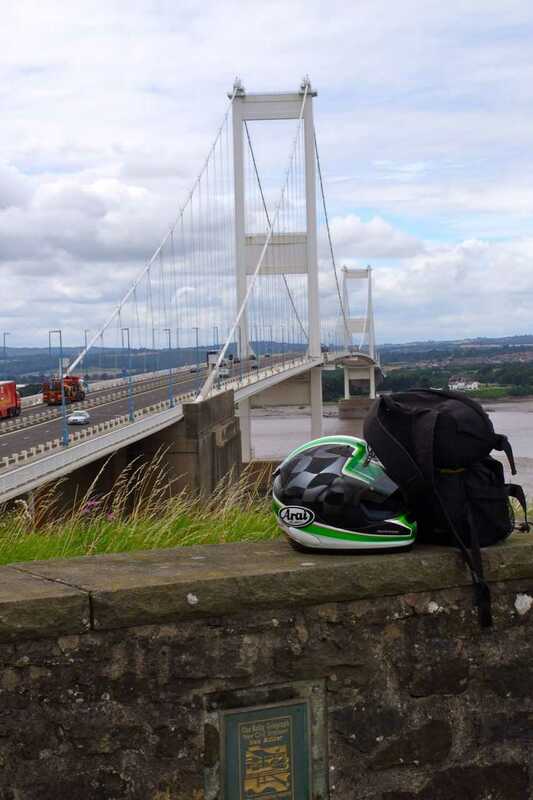 From the moment I lifted my feet outside my uncle’s flat and they fell naturally onto the pegs, I finally felt like I was at home on the beastie and by the time I was rumbling along the A-road towards Bridgend and Cardiff, I felt like Captain Cymru. 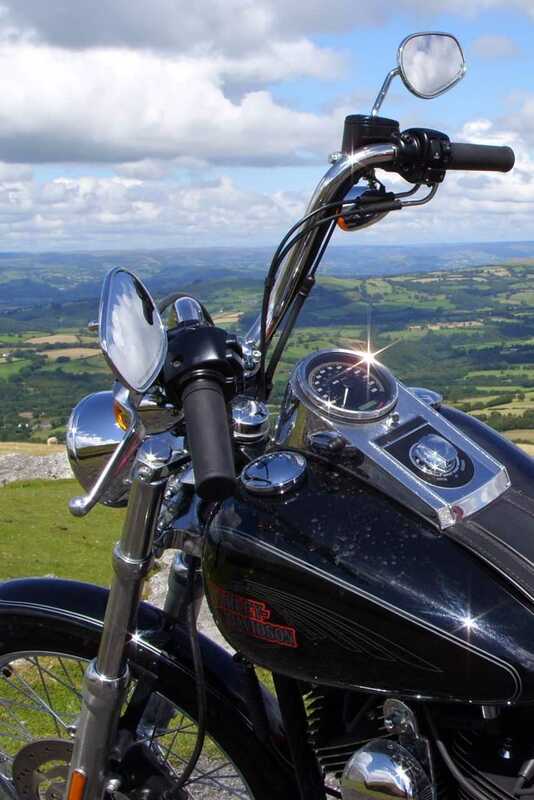 The Softail Custom isn’t really a B-road blaster as there’s just much too much of it for the point, squirt, brake, scrape, accelerate, kind of style those routes tend to encourage; and although I’d managed it on the twisting Welsh tarmac of the previous couple of days without any major strain, it was obvious that this particular hog was most at home on broad, gently undulating roads. 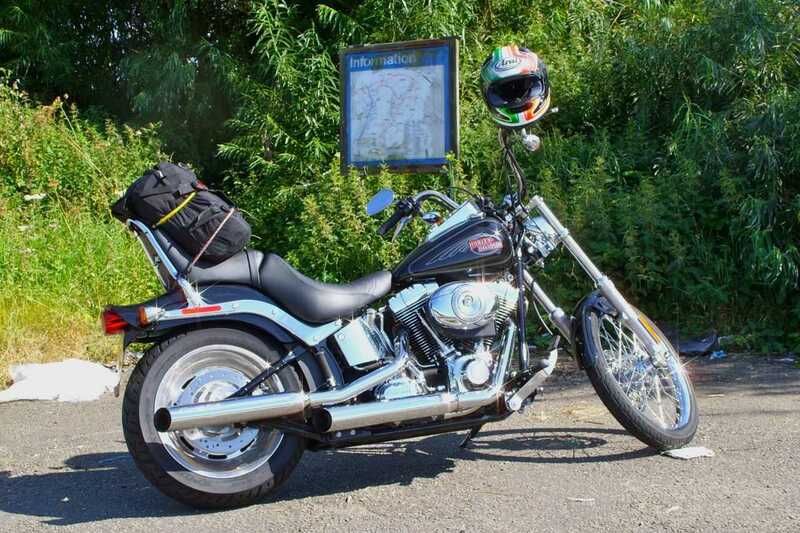 If you’re a rider who likes to get emotionally involved in your motorcycling, this sort of machine encourages you to adopt the kind of ‘Route 66’ attitude to journeys that is perfectly suited to former main arteries like the A40, the A48 and the A4. Big thanks to Warr’s London for saving my weekend and allowing me the opportunity to get beyond a long held prejudice.